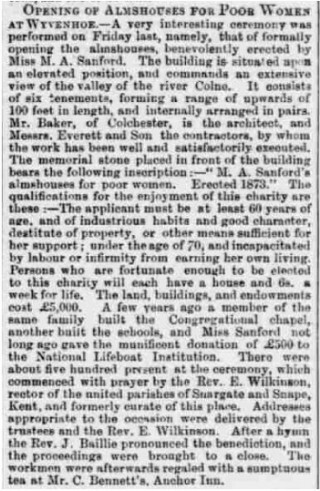 On July 25 1873 the Chelmsford Chronicle reported on the opening ceremony of the Almshouses for Poor Women at Wyvenhoe which had been funded by Miss Mary Ann Sanford. It described how on the previous Friday, there had been a formal ceremony attended by approximately 500 people which included the Trustees of the almshouses. It was attended also by the Reverend E. Wilkinson and Reverend John Baillie who conducted prayers and hymns. This ceremony would appear to have been quite a special occasion given the number of people in attendance and not only the local rector but also Rev. Wilkinson who attended the ceremony from Kent having previously been a curate in the Wivenhoe Parish. 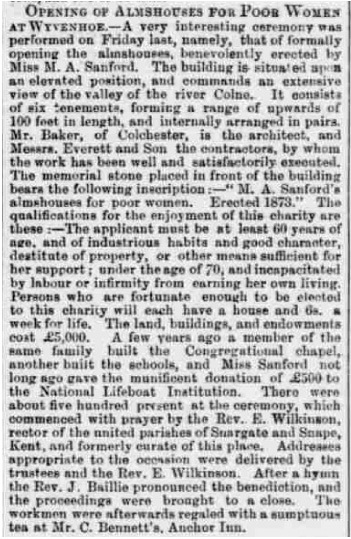 Curiously the article does not mention that Mary Ann Sanford or any other member of the family was present at the formal opening ceremony. Mary Ann died two months after this occasion in September 1873.